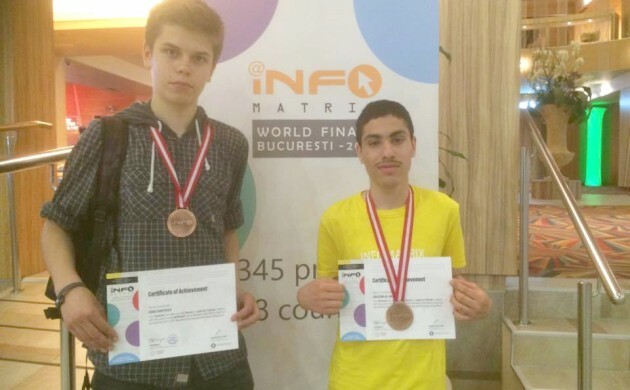 Earlier this month, Østerbro International School students, Ivan Davydov and Qassim Al-Nasheet, won a bronze medal at the 14th Infomatrix Computer Contest world final in Bucharest, Romania – with their Østrobot 1.0. Davydov and Al-Nasheet competed in the line-follower robotics category and their task was to navigate a robot along a complicated line track as quickly and accurately as possible. They managed to speed up their performance from 255 seconds in the first round to 74 seconds in the final round. InfoMatrix is an international computer project competition that brings together the world’s best IT students and at the same time promotes inter-cultural dialogue and cooperation.